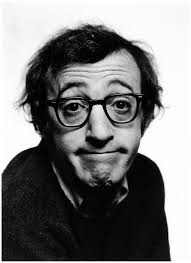 Woody Allen is no stranger to controversy. The 78 year old writer/director/actor/comedian/musician married his step daughter and has faced allegations of sexual abuse so the idea that he doesn't hire actors on the basis of race seems like small potatoes at this point. This is such a non-story that it seems hard to believe it's getting any press. Then again I have decided to run it as well. But I assure you my motivation is slightly different. I'm personally sick of stories like this. Stories where pseudo-journalists who are so hungry for a scandal they will try to create one where there is none. Woody Allen doesn't hire black actors? Are you kidding me? That's the best you could come up with? It's Woody "don't leave your kids with" Allen and that's what you go after him on? I'm about the most sensitive bleeding heart douche bag I know and even I'm not falling for this one. The part at the end where he defends his racial blindness by saying he's friendly with one black guy doesn't really help his cause. It's like "I can't be racist, I have a black friend, sort of, I know this one black guy, I mean we talked once, ok he changed my oil." Then again its probably just a joke. Wait a minute he's a comedian. It was a joke? Ok yeah the last line of the article tells me its a joke, thank god, that was a close one.